Microsoft has enhanced Office 365 SharePoint in several different ways lately, and as an author I am of course eager to cover them all. 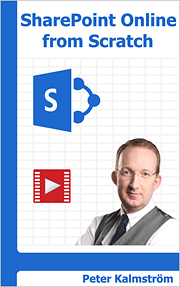 Therefore I have now released a new version of SharePoint Online from Scratch, on Amazon. SharePoint Online from Scratch focuses on no-code, hands-on instructions and explanations on how to practically make use of a SharePoint tenant for collaboration within an organization. The book also gives examples on how to use SharePoint for management of common business processes. Microsoft has a lot of SharePoint instructions online, but they have no real course or manual with a progression. You must know what you are looking for to use the Microsoft tutorials, and how can you search for something when you don't even know that it exists? Before you can browse Microsoft's articles you need to know the basics and a bit more of SharePoint, and you can learn that in my book. Video demonstrations are great, but to be optimal they need to be studied in a context. SharePoint Online from Scratch gives links to kalmstrom.com Tips articles with demos, and I believe this combination of textbook and video is a good way to explain things. Microsoft has recently introduced a new user interface for SharePoint Online apps (new experience) and pages (new model). The new interface is more intuitive and easier to use than the classic one, but for several reasons you cannot just go over and start using it everywhere. All app templates don't have the new experience yet, and among those are such common apps as the calendar and tasks list. Furthermore everything you can do in the classic interface is not possible in the new one. You can for example not connect lists to Outlook or Access, and you cannot customize new model pages to the same extent as you can do with wiki pages. The new experience, on the other hand, has features that are not available in the classic one. As a result of these differences, SharePoint administrators need to understand both interfaces, and SharePoint Online from Scratch now describes both. This has given the book more pages, but I have kept the price at the same level as before. SharePoint Online lists that use the new experience have a PowerApp button in the command bar, so that users can start creating mobile friendly apps directly from within the list they want to use. PowerApps are created automatically this way, but for best result you should modify them. I give some examples on how to do that in the new version of SharePoint Online from Scratch. Another new button in the modern experience lets IT professions create flows, which is Microsoft's replacement for SharePoint workflows. These can be used extensively with various services, and when you create a flow from a SharePoint list you will have a choice of all templates that include SharePoint. In SharePoint Online from Scratch I show how you can continue building your flow from such templates, and I also give a general description on how Flow works. The classic workflows from the earlier versions of the book are still there, because everything cannot be done with a flow or even a SharePoint 2013 workflow. A good SharePoint admin should know all the options! The new version of SharePoint Online from Scratch is released on all Amazon sites. I have joined the Kindle Matchbook program, so of you buy the paperback first, you may buy the e-book for a very low price. That way, you can take advantage of both the nice layout of the paperback and the e-book hyperlinking and use the edition that suits you best at each occasion.